This document is an executive summary of the report Driver Attitudes and Behaviors at Intersections and Potential Effectiveness of Engineering Countermeasures, FHWA-HRT-05-078, published by the Federal Highway Administration in November 2005. The Federal Highway Administration (FHWA) research addressed in this report was conducted as Task B.1 of the Integrated Program for the Interactive Highway Safety Design Model and Safety Research project (under contract number DTFH61-03-R-00128). Specifically, research was conducted to provide FHWA with information about key attitudes and behavioral influences in intersection driving performance, perceptual and cognitive bottlenecks, and constraints that can have a negative impact on intersection safety. The research also addresses engineering or educational countermeasures for intersection safety that have the greatest likely impact on performance and safety. This research includes a task analysis of driver performance at intersections, a literature review on human factors research as it relates to highway infrastructure, and focus group discussions that explore driver attitudes and behaviors at intersections. Figure 1 summarizes the information flow and shows how activities, processes, and results will be combined to produce this knowledge. This report describes the results of the focus group portion of this research. The objective of the focus groups was to identify driver attitudes and behaviors related to intersection safety and to assess the likely impacts of new or existing infrastructure-based technologies/countermeasures. Focus group discussions provide an established method to obtain this rich information. These types of discussions allow researchers to probe responses and introduce new ideas in a flexible manner that cannot be achieved with quantitative research. Also, focus groups provide continual feedback and exchange between the moderator and the respondents. The opportunity for self-correction gives more robust and accurate responses. For example, if an answer or response is unclear or ambiguous, the interviewer can rephrase the question and gather desired insights accordingly. If new ideas emerge during a focus group, the interviewer can investigate them in more depth. Because the samples are small and not representative of the total population, and thus minimally generalizable, qualitative research cannot be a valid substitute for quantitative research. Because the research relies on nondirective, semistructured interviews, the stimulus situation is not the same for every respondent. Therefore, focus group studies should not be viewed as definitive; quantitative research is also necessary to arrive at indepth conclusions. During the focus groups, participants discussed various intersection driving scenarios and associated countermeasures. The discussion scenarios were selected based on crash data and the availability of infrastructure-based countermeasures. In particular, an analysis of crash types at intersections using 1998 General Estimates System (GES) data conducted by Najm, Koopmann, and Smith indicates that the most common crash types involve straight crossing path crashes in signalized intersections (SCP/SI) and straight crossing path crashes in unsignalized intersections (SCP/UI), in addition to left turn across path/opposite direction (LTAP/OD) crashes at signalized intersections, and left turn across path/lateral direction (LTAP/LD) crashes at unsignalized intersections. (1) Three of these crash types were selected as scenarios, including SCP/SI, LTAP/OD (signalized intersection), and LTAP/LD (stop-controlled intersection), based on maximizing the diversity of situational factors and countermeasure types that could be presented to focus group participants. In addition to these crash types, a scenario based on rear-end crash situations was also added, because this type of crash at intersections was highly prevalent. Figure 1. Flow of research inputs, activities, and deliverables. 18-to 35-year-old female drivers only. 18- to 35-year-old male drivers only. 35- to 55-year-old drivers of both genders. 65+-year-old drivers of both genders. At each site, the focus groups took place over two separate evenings, with two focus groups conducted per evening. A total of 119 individuals participated in the focus groups. Table 1. Number of focus group participants as a function of location and age/gender characteristics. To reduce the chances of biasing the participants' evaluations of the relative potential effectiveness of individual countermeasures, the researchers tried to match the level of description and detail for all countermeasures, as well as present the information in a common format where possible. Scenario 2: Left Turns at Busy Intersections. Scenario 3: Turning Left Onto a Major Roads With Moderate Traffic. The Moderator Guide in appendix B of the main report provides a step-by-step overview of the discussion flow for the scenarios. In general, the discussion focused on describing each scenario, gaining an understanding of driver behavior in the scenarios (i.e., asking how drivers behave in this situation), and understanding the many primary and secondary factors (e.g., situations, attitudes, habits, beliefs, and consequences) that influence their decisions and behaviors during the scenario (i.e., why drivers behave the way they do). 1.3: Advance traffic light warning signs. 1.4: Intersection collision warning systems. 3.2: Synchronized adjacent traffic signals. The researchers developed a brief take-home survey (shown in appendix D of the main report) to obtain participant responses about relevant intersection activities that were not discussed in the focus groups due to time restrictions. The questionnaire included 12 Likert scale and open-ended questions. All questions addressed the following scenario: "These questions are about the driving situation discussed in the group where the light turns yellow just as you approach an intersection. Specifically, you have enough time to stop if you brake quickly; otherwise the light is likely to turn red while you are in the intersection unless you speed up quite a bit." This investigation produced a considerable amount of mostly qualitative data because of the range of driving scenarios and engineering countermeasures examined during the focus groups, the number and variability of participants in terms of gender, age, and location, the open-ended nature of many of the questions, and the participants' degree of willingness to share their opinions openly. In short, there were almost as many unique answers to the questions posed to focus group participants as there were focus group participants. The abundance of data challenged the project team in their efforts to identify patterns, trends, or specific responses that can be justifiably considered as study conclusions. Appendix E in the main report shows the project team's attempt to distill and summarize the focus group participants' responses into a cohesive and interpretable form. The conclusions presented below continue this process, focusing on results that reflect the behaviors, attitudes, and habits of all or most of the focus group participants related to several key questions. The results and conclusions below are organized according to the four intersection scenarios that have been the focus of this investigation: (1) red-light running, (2) left turns at busy intersections, (3) turning left onto a major road with moderate traffic, and (4) rear-end crashes. What are drivers most likely to do in this scenario? Why do drivers engage in these behaviors? What engineering countermeasures have the most promise for improving traffic safety? Scenario 1 was described to the focus group participants using the graphics shown below in figures 2 and 3 with the following verbal description: "Approaching a signalized intersection at speed, the light turns yellow. The driver is far enough away from the intersection that he/she can stop if he/she brakes hard, but is likely to enter the intersection on an early red if he/she accelerates." Figure 2. Graphic 1 used to describe scenario 1: Red-light running. Figure 3. Graphic 2 used to describe scenario 1: Red-light running. For this scenario, the focus groups indicated that almost all older drivers would stop at the intersection, while many to most middle-aged and younger drivers would go through the intersection and violate the red light. Results from the take-home survey confirmed this general trend. Interestingly, the drivers who indicated that they would go through the light acknowledged that they would do so in a deliberate and purposeful manner based on the current circumstances. In other words, they recognized the risks associated with running a red light under the circumstances described above, yet would often choose to do so anyway. Figure 4 summarizes the responses from key questions included in the take-home survey. Figure 4. Summary of key scale responses pooled across gender, age, and location. 1 All countermeasures are labeled using an "X.Y" designation, where "X" refers to the scenario and "Y" refers to the relevant countermeasure associated with that scenario. For example, "1.1" refers to the first countermeasure discussed within scenario 1, and "1.2" refers to the second countermeasure discussed within scenario 1. For older drivers, stopping is their planned, default driving behavior in this situation. For middle-aged drivers, going through the light is their default strategy, unless they thought that the vehicle in front of them was going to stop. For younger drivers, traffic and driving conditions, being in a rush, and the behaviors of a lead vehicle are all factors that lead them to go through the light. For most drivers, additional factors that influence their behavior in this scenario include the status of cross traffic, obstructions, roadway conditions (e.g., visibility, traction), congestion levels, and the presence of pedestrians. Younger drivers are generally less likely to go through the light if their parents are in the car with them. 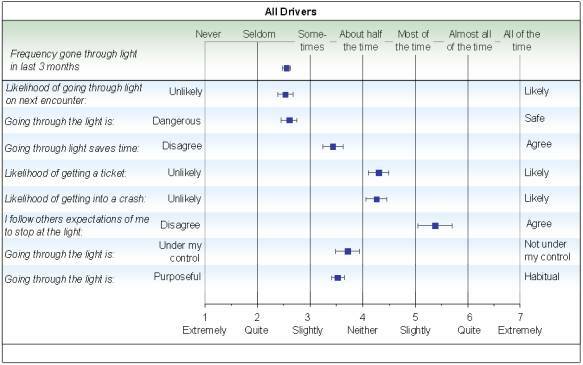 The take-home surveys indicated that drivers' decisions to go through on a late yellow/early red light are primarily based on attitudes/beliefs and social norms. This encouraging preliminary finding means these factors can be addressed by typical public awareness and similar advertising campaigns. The factors that are more difficult to change, such as habits and experience with critical incidents, had no impact in driver decisionmaking. Opinions about red-light cameras (countermeasure 1.2) were strongly influenced by both prior experience and age. In the Washington, DC, and Chicago, IL, focus groups (where there are red-light cameras in operation), older drivers did not feel that they improved safety, while younger males did feel that they improved safety. In the Seattle, WA, focus groups (where there are no red-light cameras), this trend was reversed. All subjects believed that implementation of red-light cameras should be fair with the specific aim of improving safety, not generating revenue. Opinions about high-visibility traffic lights (countermeasure 1.2) were mixed: older drivers believe that they would improve safety, while younger drivers (males in particular) believe that they would not help or did not apply to them. Many drivers thought that this countermeasure would work best in suburban or rural areas because it might otherwise get lost in all of the other downtown lights and other traffic control devices. Opinions about the likelihood of advance traffic-light warning signs (countermeasure 1.3) improving safety were very mixed. Most subjects thought that this countermeasure would be most helpful in high-speed areas (i.e., rural and suburban locations). Opinions about intersection collision warning systems (countermeasure 1.4) were very positive; many drivers—across all age groups and locations—believe that this type of countermeasure would definitely aid drivers' ability to stop before entering a potentially dangerous intersection. Some respondents expressed concerns about drivers' knowledge of the system and questioned whether warning information would occur in time for drivers to stop safely. Many drivers expressed concern that this countermeasure was aimed at the law-abiding driver, not the red-light runner. However, most drivers preferred this approach to an in-vehicle only approach. Scenario 2 was described to the focus group participants using the graphics shown below in figures 5 and 6 with the following verbal description: "Stopped in the middle of an intersection, waiting to make a left turn on a busy street; an oncoming car is also waiting to turn left and makes it difficult to see other vehicles approaching in the next lane. There is no dedicated turning lane and no dedicated turn signal; cars are waiting behind to also turn left (or go straight)." Figure 5. Graphic 1 used to describe scenario 2: Left turns at busy intersections. Figure 6. Graphic 2 used to describe scenario 2: Left turns at busy intersections. For this scenario, the focus group data were mixed, with many drivers avoiding this situation altogether (e.g., by taking a different route or making a series of extra right turns). About half of the subjects would wait for the light to change before making the turn, and some of the younger drivers indicated that they would force their way into the oncoming lane, thereby causing other drivers to slow down or stop. Many drivers clearly did not trust their ability to judge traffic gaps. When drivers choose to make this maneuver, they are inclined to wait until the safest possible moment, and then accelerate quickly through the intersection. Many drivers expressed concerns about the presence of pedestrians, bicyclists, and low traction conditions, and take these factors into account when making decisions about whether to turn or not. Overall, this driving maneuver is seen as difficult; therefore, many drivers have developed set behavioral strategies that, in their view, reduce the likelihood of a crash. Opinions about protected left-turn lights (countermeasure 2.1) were very positive, with almost all drivers expressing the opinion that this measure is very effective at improving safety and expressing the wish that they were available at all busy intersections. Scenario 3 was described to the focus group participants using the graphic shown below in figure 7 and with the following verbal description: "A vehicle is stopped on a minor road with a stop sign, waiting to turn left onto a major road (that has no stop sign); a consistent flow of vehicles going at high speeds is crossing in both directions on the major road." Figure 7. Graphic used to describe scenario 3: Turning left onto a major road with moderate traffic. For this scenario, the focus groups indicated that drivers exhibited very mixed behaviors. Slightly more than half of the drivers indicated that they would make the turn as best as they could; slightly less than half of the drivers indicated that they would first turn right, and then find their way back to their original route. This scenario is visually demanding, as most drivers alternate their scanning between the left and right traffic directions, while estimating gaps and keeping an eye out for pedestrians and bicyclists. Opinions about automatic gap detection devices (countermeasure 3.1) were not consistently positive. Interestingly, many Washington, DC, drivers were receptive to this idea and thought that it would be helpful, while almost all drivers from Seattle, WA, and Chicago, IL, did not think that this countermeasure would improve safety. Many drivers might not trust the system and would prefer to make their own gap judgments or rely on other countermeasures. Many drivers were concerned about system accuracy. Opinions about synchronized adjacent traffic signals (countermeasure 3.2) were generally positive, with well over half of the drivers expressing the opinion that this countermeasure would improve safety. Scenario 4 was described to the focus group participants using the graphics shown below in figures 8 and 9 with the following verbal description: "Approaching an intersection at speed, the car in front stops suddenly when the light changes to yellow. The driver needs to slam on the brakes to avoid a rear-end collision." Figure 8. Graphic 1 used to describe scenario 4: Rear-end crashes. Figure 9. Graphic 2 used to describe scenario 4: Rear-end crashes. Drivers select following distances according to a predetermined heuristic—like a 2-second rule—that leaves sufficient space between their vehicle and a lead vehicle. Most drivers try to anticipate a lead vehicle's actions using cues such as the status of traffic signals, brake lights, or other signs that the vehicle is slowing. If drivers believe they will not be able to slow in time to avoid a crash, many will change lanes or even drive onto a curb or the roadway shoulder. More than one-third of focus group participants had been involved in a rear-end near-miss because of a variety of reasons, including tailgating, distraction, making faulty assumptions about other vehicles, or excessive speed. Opinions about intersection rumble strips (countermeasure 4.1) were split among the focus group participants; one-half believed they would improve safety and about half believed they would not improve safety if placed at every intersection. Most drivers thought they would lose their effectiveness if placed at every intersection because drivers would get used to them; many believed that the noise and vibration would become annoying. Opinions about improved skid resistance (countermeasure 4.2) were positive. Most focus group participants believed they would improve safety and would be preferable to rumble strips. Many believed a combination of the rumble strips and the improved skid resistance countermeasure would be the most effective intervention. Najm, W.G., Koopmann, J.A., and Smith, D.L. (2001). Analysis of crossing path crash countermeasure systems. In: Proceedings of the 17th International Technical Conference on the Enhanced Safety of Vehicles (Paper #378). Amsterdam, the Netherlands. June. (http://www-nrd.nhtsa.dot.gov/pdf/nrd-01/Esv/esv17/Proceed/00013.pdf). Najm, W.G., Mironer, M., Koziol, J., Wang, J-S, and Knipling, R.R. (1995). Synthesis report: Examination of target vehicular crashes and potential ITS countermeasures (DOT-VNTSC-NHTSA-95-04; DOT-HS-808 263). Cambridge, MA: Volpe National Transportation Systems Center. Bonneson, J., Zimmerman, K., and Brewer, M. (2002). Engineering countermeasures to reduce red-light running (Report No. 4027-2). College Station, TX: Texas Transportation Institute. Researchers—This study was performed by C.M Richard, E.F. Michaels, and J.L. Campbell at Battelle Human Factors Transportation Center in Seattle, WA. Distribution—This TechBrief is published on the Turner-Fairbank Highway Research Center Web site only. To download this TechBrief, go to www.fhwa.dot.gov/research/tfhrc/. Availability—The report, Driver Attitudes and Behaviors at Intersections and Potential Effectiveness of Engineering Countermeasures (FHWA-HRT-05-078), which is the subject of this TechBrief, is being published on the Turner-Fairbank Highway Research Center Web site only. To download this report, go to www.fhwa.dot.gov/research/tfhrc/. Key Words—Driver attitudes and behaviors, focus groups, intersection safety, engineering countermeasures.